Peter Lane, The King, Super-8 film, 1998, 2 mins 30 secs. Matthew Rees, Stalkers Inc., video, 2003, 7 mins. Sally thinks she is pretty popular, until she finds out she is the only one of her friends who has not had their very own stalker. It's not until Sally stumbles across Stalkers Inc. the complete stalking service provider, that she really feels like one of the gang. However, things do not quite go to plan…. 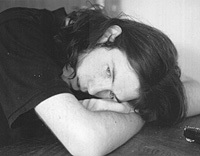 Stu Thomas, Luck Be a Person Tonight - Sounds in Q minor, video, 2003, 15 mins. Part 1 of a series of 1 minute films shot in 1 hour as part of the Foundation Year Studies at V. C. A. working in groups of approx. 3. The challenge for students was to storyboard, location scout, organize actors/props, etc and edit in camera. All films are super 8, b/w, silent….directors in running order ..B. Harrison, E. Aitken, N. Reid, L. Ellnor, E. Friedman, M. Errichiello, N. Green, D. Zielinski, J. Lording, A. Cordona, K. Elfman, C. Harland, A. Gray, J. Mahon, C. Freer… lecturer…. Moira Joseph….…Foundation Year co ordinator…Libby Porter. Three works in progress; a relationship, a film, a song. Fragments - stopping, starting, circling, pausing but always persisting. Some images of a jumpy sort of dog. Rusden student group project, Into the Woods, video, 2003, 5 mins. "homage to a great australian artist"
Dann Gardiner, Anna Melnikov, Mietta Preston. Rad Rudd, Copy, Right?, Super-8 film, 2003, 6 mins. I ask you all to close your eyes and listen to Stalis Vetch's "Human Corrision" and "Dead Today", as I privately view some of my favourite movie moments. Aaron Goldberg, Smoke and Lights, video, 2002, 8 mins 36 secs. Darren, Fiona, Joe and Anne are 4 young adults driving home after a big night out. They decide to stop off near an airport runway to watch aeroplanes and smoke marijuana. Darren talks about seeing UFOs while getting stoned, much to the displeasure of his temperamental girlfriend Fiona. After getting stoned they continue on home, only to have the car stall on them in the middle of nowhere. An argument breaks out, but when Fiona notices some lights in the distance, it seems that everything is OK. Or is it? Tony Woods, The Desired For, Super-8 film, 2003, 14 mins. 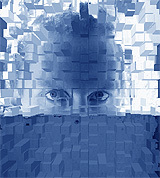 A way of framing the many formal and conceptual ideas on which the making of my film art is based…. 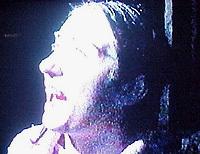 Moira Joseph, No War, Super-8 film/video, 2003, 12 mins. 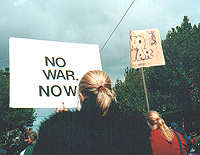 During April and May 2003, thousands of people from a multitude of religious denominations and community groups took to the streets of Melbourne to protest against Australia's involvement with the war in Iraq. Anne Scott, Gushing, video, 2003, 3 mins. My video work is an investigation of sound and image and the relationship between them. Water gushing has an emotional resonance in its explosive movement which is an analogue for the motion of sound waves, echoed by the sound accompanying the image. The rushing and gushing is also reflected in the emotion of the viewer, who cannot resist being pushed along with the energy and pace of the waves seeing an echo in the sound and in the image. Dean McInerney, Mungo Passage, Super-8 film, 1997, 4 mins. An expedition through an ancient cultural site adopts and mimics the passage of the red kangaroo. An unconscious act that reproduces the hunters dreaming of the hunted. AUDIENCE VOTES: At the end of the screening, audience voting forms were handed out, asking people to nominate their three favourite films of the night. Aaron Goldberg, Smoke and Lights, 9 votes; Matthew Rees, Stalkers Inc., 5 votes; Rusden Students, Into the Woods, 5 votes.